The dbh Flashlight Windproof Gilet (currently £34.99 here – also see the women’s version) is squarely targeted at the commuter market, but especially in this charcoal version, rates well in the style stakes. 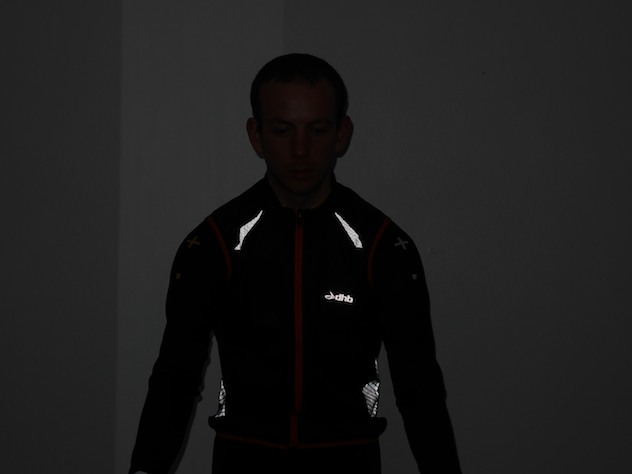 The Flashlight gilet is built to a surprisingly high standard for the price. I was always impressed by the dhb Ultralight gilet for the money, but this definitely takes things a step further – the panels are well thought out and the stitching and materials are solid and holding up well to daily use so far. The sturdy YKK zip is a particular highlight – it has an excellent motion and locks in place wherever you leave it. 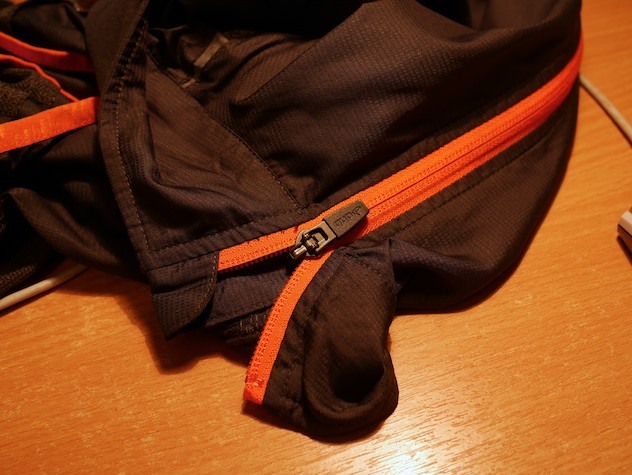 Although it’s still not ideal for gloves (I use the little Alpkit zipper tags on most of my gear to make this easy) you can work the zip one-handed without too much trouble, and there is an ample zip park to guard against chafing when it’s fully done up. Off the shelf the coating on the Flashlight gilet is top notch – it beads up nicely in even quite heavy rain (although since you are wearing a gilet, you’re already on to a loser if the plan was to stay bone dry). This is also lasting better than expected after half a dozen cycles in the washing machine. The arm holes are elasticated but not massively – but this isn’t as much of an issue as the (non) snugness of the collar, given the relative orientation to the wind. There are no pockets, which is fine by me as it really cuts down on bulk (frankly I’ve never really understood why people would want jersey pockets and jacket pockets on top). The relaxed cut makes it very easy to access your jersey pockets even when the gilet is done up – job done. 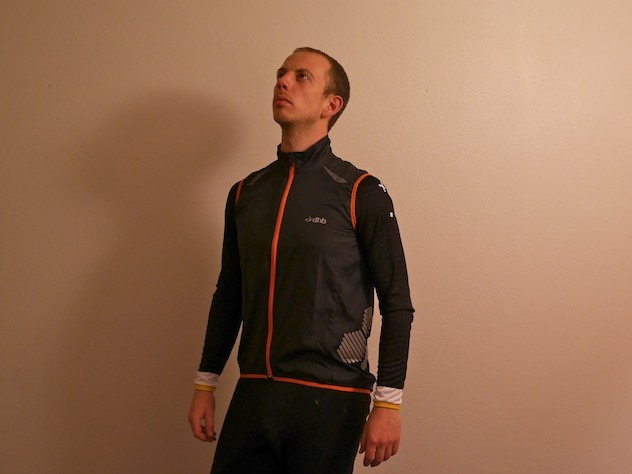 The fabric is indeed windproof and has kept me comfortable right down to freezing point (with the right gloves and jersey – remember the gilet is just letting the layer(s) below do their work – it’s not supposed to provide significant insulation). Although the collar isn’t the snuggest there is a good storm flap behind the zip, something conspicuously lacking from the Ultralight option. YMMV- as always, warmth is quite an individual thing. 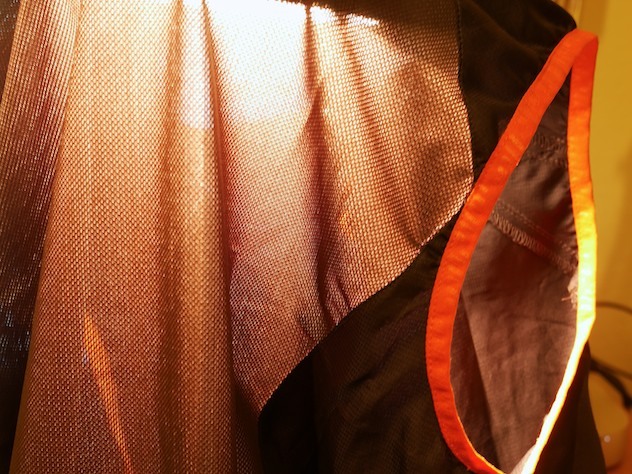 The back is mostly made of a fine mesh for optimum ventilation. I really haven’t found myself working up a sweat in this gilet at all, which makes it perfect for shoulder season riding where you can be riding over frozen puddles in the morning and climbing home under a solid evening sun. Don’t count on it keeping your back dry if you wear a rucksack though (although this should be obvious, considering your back will still get sweaty with a rucksack even if you don’t wear a shell layer at all). 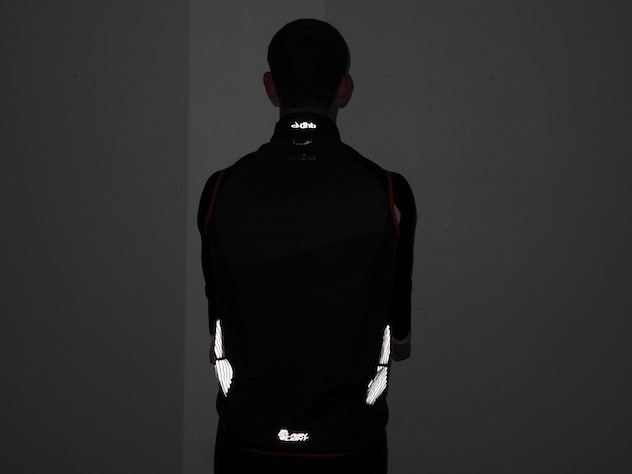 The reflectives on the Flashlight Gilet are bona-fide Scotchlite and throw back light with the best of them. 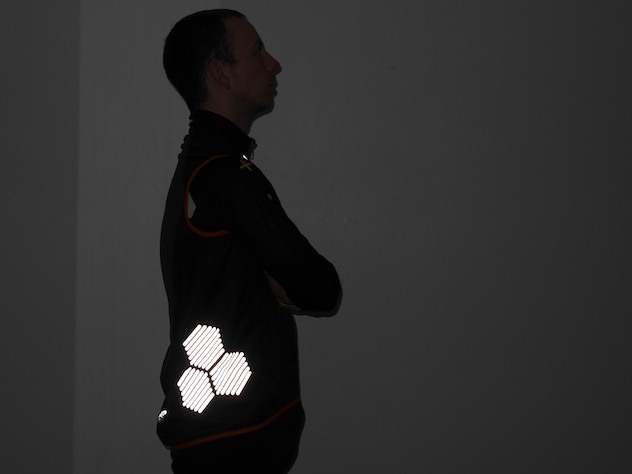 Slightly unfortunately the reflective detailing seems to have been chosen to fit in with other items in the range (like the jacket) despite the latter relying on a rear zip pocket cover for back-centre reflectivity – something which is largely lacking in the gilet. Take a careful look at the size guide. I’m just under a 32″ waist (small to x-small) but with almost a 44″ chest (x-large), so I took a punt on medium, and this has worked out well – the chest isn’t tight and the elastic in the waist is taking up up any slack. The cut is distinctly on the casual side so it’s not too critical so long as it’s not too tight! In particular, I found the collar a little too loose which compromised warmth on the coldest days, but it is lined with a nice soft hand, pleasant against the skin. There is an ample drop tail – just about long enough to sit on, which goes some way to compensate for the collar. In contrast as I have moaned before, the dbh Ultralight gilet which is my go-to item has a ludicrously short tail (often sitting up at my kidneys if I have anything in my jersey pockets). The Flashlight Windproof gilet crunches down to about the size of a clenched fist, easy to stow even if you are carrying all the essentials in your jersey pockets already. While it isn’t the lightest at 123g (versus the dhb Ultralight gilet at 72g) this is still only the weight of two gels, or a big mouthful of water – nothing much to write home about. With solid construction, a good fit (if you want a relaxed cut) with an ample drop tail and surprisingly good water-repellent coating, only the slightly awkwardly-placed reflectives put a damper on this item. Overall, hard to beat for the asking price (and if you can catch this on sale it will certainly be a steal).